Several pathologies require immobilization of the wrist and thumb joints in a wrist- hand -finger orthosis known as the long thumb opponens or thumb spica orthosis. Depending on the exact diagnosis, this immobilization orthosis typically positions the wrist in slight extension and the thumb carpal- metacarpal (CMC) joint between radial and palmar abduction, with the metacarpo-phalangeal (MP) joint slightly flexed and the interphalangeal (IP) joint free. For EPL repairs, and tendon transfers, the thumb would be positioned in full extension and the orthosis would include the IP joint in extension as well. There are three basic design options for a long opponens orthosis: Volar based, radial gutter and circumferential. Each design has benefits to consider in terms of stability, material selection, comfort and ease of fabrication. Each condition and each individual client should be assessed in order to match the most appropriate design with the client’s unique status and needs. 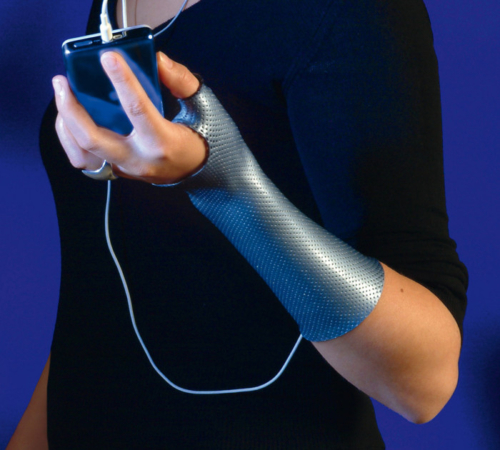 Orfit Industries offers a variety of thermoplastic materials and easy fabrication techniques for this orthosis. Volar long opponens orthoses are usually fabricated from 3.2 mm (1.8”) thick drapy materials which conform best around the thenar anatomy. Orfit Flex NS is an excellent example of a highly conforming material that works well for this purpose. Elastic based materials also work well for this orthoses, including Orfit NS, Orfit Colors NS and Aquafit NS, Orfilight, and Orfilight Black NS in the 3.2 mm (1/8”) thickness. Circumferential designs can typically be fabricated using 2.0mm / 1/12” thicknesses, as the material protects both the volar and dorsal surfaces. Elastic non-stick coated materials such as Orfit NS, Orfit Colors NS and Aquafit NS, Orfilight, and Orfilight Black NS are all excellent choices for this application. Use the temporary bonding as an advantage in forming circumferential closures by pinching or overlapping the edges. Then when the material hardens, the edges can be popped apart and trimmed. Orfit Industries now offers pre-cut Wrist +Thumb Immobilization Orthoses in four excellent colors and instructions in our Educational Corner. The radial gutter design immobilizes the thumb and wrist but covers only half of the volar and half of the dorsal surfaces. Depending on the individual client’s size, 3.2 mm (1/8”) or 2.0 mm (1/12”) thick materials can be utilized. This design might be appropriate for individuals seeking lighter weight orthoses that do not feel overly bulky or heavy. Orfilight and Orfilight Black NS might also be useful here, especially with elderly arthritic patients who might not tolerate a heavier plastic material. Immobilize bony structures and promote healing. The wearing schedule for any orthosis depends on the specific diagnosis and condition of each client. In general, acute and inflammatory conditions require full time wear. Adequate time for range of motion exercises and functional activities must be included in the rehab program. The orthosis wearing schedule should be reassessed frequently so that maximum benefit is obtained without interfering with activities of daily living. The goals of the Short Thumb Spica are twofold: maintain the thumb in opposition, and preserve the first web space. The Orfit thumb gauntlet (butterfly pattern) addresses both of these goals, but it may be difficult to remove especially when the patient has to wear his orthosis during the night.